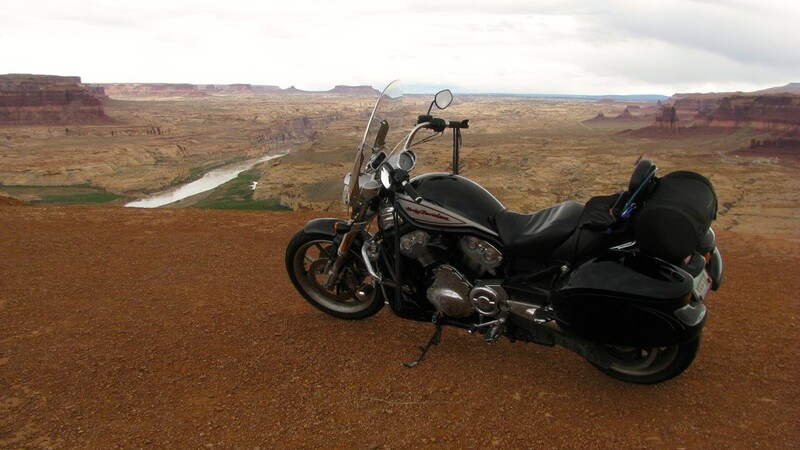 The Vector has seen some mighty fine country over the years and this page shows off the best photos I have of this bike. The Vector atop the Powder River Pass on US16 west of Buffalo, Wyoming. This was the first climb of a real mountain pass for the Vector and it was a blast. I’ve ridden this road previously on the Cruiser and the trip was faster and easier on the Vector. A view of the Vector in front of the Beartooth mountain range from US212 in northern Wyoming. This vantage point is along the climb up Beartooth Pass. The sky is a bit hazy due to wildfires to the southwest. The Vector in front of a picturesque lake at the base of Hogback mountain along US212 in northern Wyoming. This photo is tradition for me; every time I pass this point I stop for the photo. Neither the Vector or I are breathing very well with all the smoke in the air. This picture looks west along Montana route 43 and the smoke from the nearby wildfire is thick. That little red dot in the sky is the sun, almost eclipsed by the thickness of the smoke in the air. The Vector along an area of recent fire damage. A few years ago a wildfire laid to waste this region along the Blue Mountains Scenic Byway between Granite and Ukiah in Oregon. This explains why all the greenery is the same height (about 3ft or 1m). The previous fire before that was only about 12 years ago, so most of the tree trunks left standing are rather thin. A portion of the forest that survied the most recent fire appears on the opposite ridge. The Vector along a National Forest road a few miles west of Ukiah, Oregon. The forest is thinning as we leave the higher elevations. A low-angle view of the Vector along the Going-to-the-Sun road in Glacier National Park in Montana. Back in 1999 I took a nearly identical photo of my older bike, the Cruiser. As you near Copper Harbor, Michigan on US41, the road narrows for the last few miles and the forest canopy blocks most of the sky. It’s a bit like driving in a forest tunnel. The Vector gazes down the Lake Superior coastline from the vantage afforded by Brockway Mountain. My nice little campsite at the KOA in Sheridan, Wyoming. This would be the first night I slept in my new Nemo Morpho AR 2 tent. I had arrived just after 5pm local time so the other tent sites were empty. The Vector along the Chief Joseph Highway, just off the south wall of the Elk Creek Canyon. The bridge over the canyon is just out of view to the right. The money shot that you’re obligated to take when you travel US-12 past the south side of Mt. Ranier. The Vector enjoys some of the shade from the windblown trees just off the west coast of the Olympia Peninsula. The Vector rests for a moment while I photograph the VLA radio telescope on the high desert plains of New Mexico. Traveling north on the Tail of the Dragon (US129). It had been raining most of the day and the roads were still wet, so I couldn’t really push the Vector too hard. Photos taken by zeephoto.com and purchased for my personal use. A glamour shot of the Vector in front of the suspension bridge between Maysville, Kentucky and Aberdeen, Ohio as viewed from Maysville. The late-afternoon sun casts the bridge in a nice light. The Vector gazes out over Yellowstone Lake. I had the entire overlook to myself, so I took the liberty of riding the Vector all the way down the path to the viewpoint. I’m going to get wet. My route takes me through these mountains and there’s no way I’m going to avoid the precipitation in those clouds. Little do I know that the temperature under those clouds will drop from 50˚F to 30˚F, causing the rain to turn to snow and forming ice on the leading surfaces of my bike, boots, and helmet. Someday I’ll attend a MIAZ run and manage to avoid snow. Ghost and Karen railing around the curves on the Tail of the Dragon (US129) near the eastern Tennessee border. These photos were purchases from killboy.com. Ghost and Karen railing around the curves on the Tail of the Dragon (US129) near the eastern Tennessee border. These photos were purchases from us129photos.com. This is the corner previously occupied by Zee of zeephoto.com. She’s the photographer who captured Ghost and the Vector in the rain a few years ago. Ghost and Karen railing around the curves on the Tail of the Dragon (US129) near the eastern Tennessee border. These photos were purchases from 129slayer.com. The Vector at the west wall of Glen Canyon.